“How does he smile and shake their hands like that?” asks Tony Lip (Viggo Mortensen). “Because it takes courage to change people’s hearts,” replies Oleg (Dimiter D. Marinov) as they discuss Dr. Don Shirley (Mahershala Ali) an extremely talented African-American musician in the early 1960s in comedy/drama, Green Book. In 1962 New York, Tony Lip is a bouncer from an Italian-American neighborhood who needs to find work while the club where he works is closed for renovations. Tony gets a call from a representative of Dr. Don Shirley who needs a driver for an upcoming concert tour. To Tony’s surprise, Don is an African-American singer. Don wonders if Tony he’s going to have any issues working for a black man, and Tony claims we won’t. Tony asks where the tour will be taking them and Dr. Shirley explains they’ve be traveling from Manhattan to the Deep South. Tony warns Dr. Shirley there will most likely be some trouble if he visits the Deep South. Dr. Shirley appreciates Tony’s bluntness and candor, and hires him to be his driver and bodyguard. The unlikely pair hit the road on a journey in which they’ll be faced with racism, discrimination, threats, and danger. They come to depend upon and learn about each other, themselves, and the worlds they come from while using the “green book,” a guide to the few establishments that are safe and accept African-Americans in the 1960s. 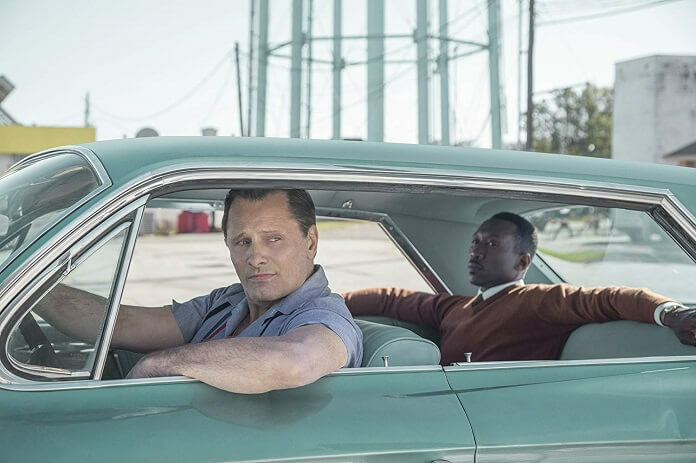 Inspired by a true story, Green Book is a charming, funny, and touching film about two very different people from two vastly different parts of New York who, by traveling the roads together, become life-long friends and become better people because of their shared experiences. Viggo Mortensen delivers one of his best performances as Tony Lip, a blunt, tough, Italian-American from the Bronx who only takes the job to drive Dr. Shirley to provide for his family and to stay clear of getting involved in business with the wise guys in his neighborhood. Mortensen brings humor, street smarts, and authenticity to the role, aspects of the character which may have been lost in the mix if another actor had portrayed Tony Lip. Mahershala Ali is pitch-perfect as Dr. Don Shirley, an extremely talented, particular, cultured, and haughty musician who at first wants very little interaction with Tony on the trip but slowly starts to appreciate his straight, no-nonsense talk and take on the world. It’s the chemistry between Mortenson and Ali that elevates the film to another level. The writing is smart, witty, and moving, revealing just how different the two men view the world and how they belong in it. The production, costumes, sets, and cars are perfect, bringing back to life America in the early ’60s. Inspirational, moving, and enjoyable, Green Book is a true crowd-pleasing, highly entertaining film, and one of the best pictures of the year. It’s one of the few recent films that leaves a smile on your face after a screening.